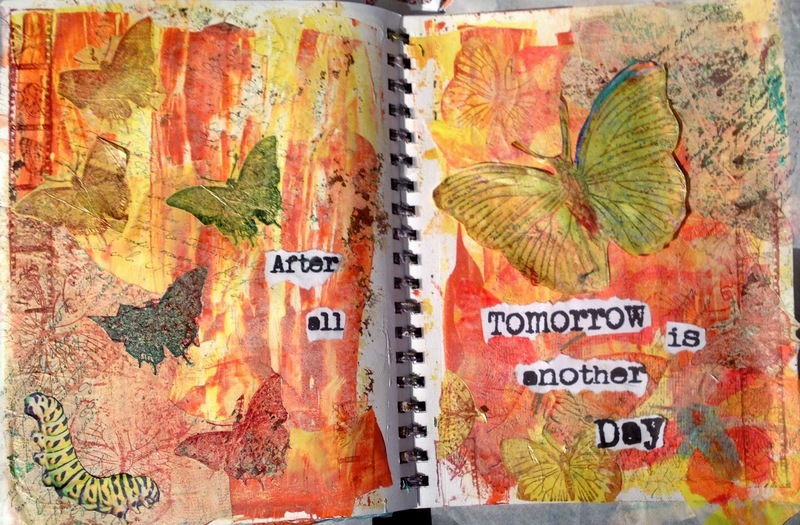 I was inspired to do this journal page by the challenge posted on Art Journal Journey for favorite quotations and the Butterflies prompt at Moo Mania. Among my favorite quotations is the ever optimistic perspective of Scarlett Ohara in Gone with the Wind, "After all, tomorrow is another day." Thinking about how tomorrow can bring a change to make what seems to be a grim prospect into a bright adventure brought to mind the caterpillar vs butterfly image. The caterpillar wages on grinding leaves to eat and spinning her cocoon and the butterfly just seems to flit away with her past behind. I began this page by using the ever essential tool, the credit card, to swipe on orange and yellow paint. I used Martha Stewart's pearlized craft paint because I just love that finish. I had some beautiful scrap deli paper that I had used to clean my Gelli plate so I stenciled and stamped images of butterflies to cut out. I used a script stamp, a cheese cloth stamp, and a filmstrip stamp to add more to the background. (I got up in the middle of the night and worked so I totally forgot to make my step outs.) A close up shows some of this texture. Lastly, I added a small image of the caterpillar to convey my message.